By Road Situated within the heart of Galashiels, Scottish Borders Campus is a one hour drive from Edinburgh. Three major road routes link the Scottish Borders to Central Scotland and the North of England, bringing Carlisle and Newcastle both within easy reach. Some local bus services stop outside the Campus. Distance from Edinburgh 33 miles, Glasgow 69 miles, Newcastle 70 miles. By Train The new Borders Railway opens on 6th September 2015. Train times are available on the Scot Rail website. Please click on this link: www.scotrail.co.uk/. 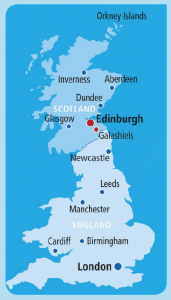 By Air Edinburgh, Glasgow and Newcastle international airports are all within a one or two hour drive. All airports have direct connections to national and worldwide destinations.